Sometimes, when there’s love, you really don’t need anything else to create a perfect wedding. This was true for Shelia and Steven Keegan, who eloped on June, 5th, 2014. The couple, who resides in Venice Beach, FL, decided that they didn’t need hundreds of guests, a fancy dinner, or a pricey location to make their wedding special. 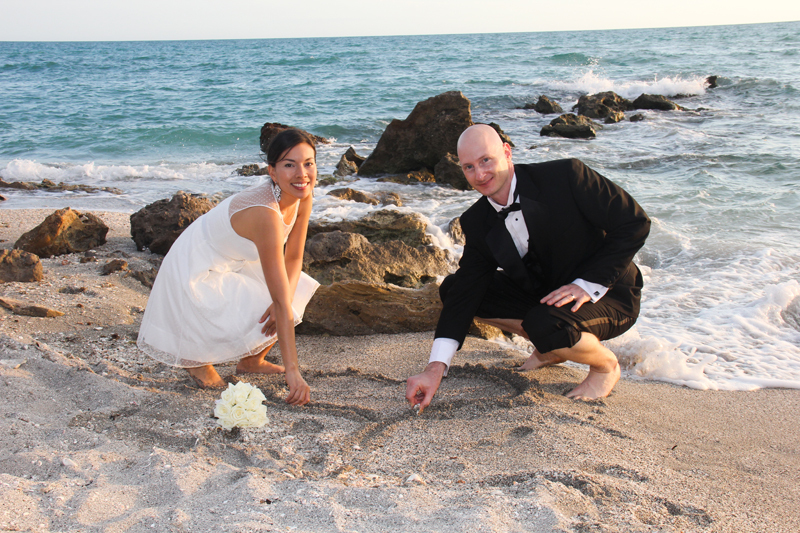 Instead, all they needed was the natural beauty of Caspersen Beach, a minister, and their desire to commit to each other. From the handwritten “just married” sign set up on the shores of this beautiful locale to the ocean backdrop to the intimate moments the happy couple shared, this elopement would be a day neither of them would ever forget. When most people think of an elopement, they think of a drive-thru wedding chapel in Las Vegas, but Shelia and Steven’s elopement wedding ceremony had all the earmarks of a traditional ceremony, and it was as unique as it was beautiful. The bride wore a knee-length white wedding dress with a stylish, narrow white belt and a sheer, see-through piece at the upper chest and shoulders. She carried a small but elegant bouquet of white roses to complement her dress. 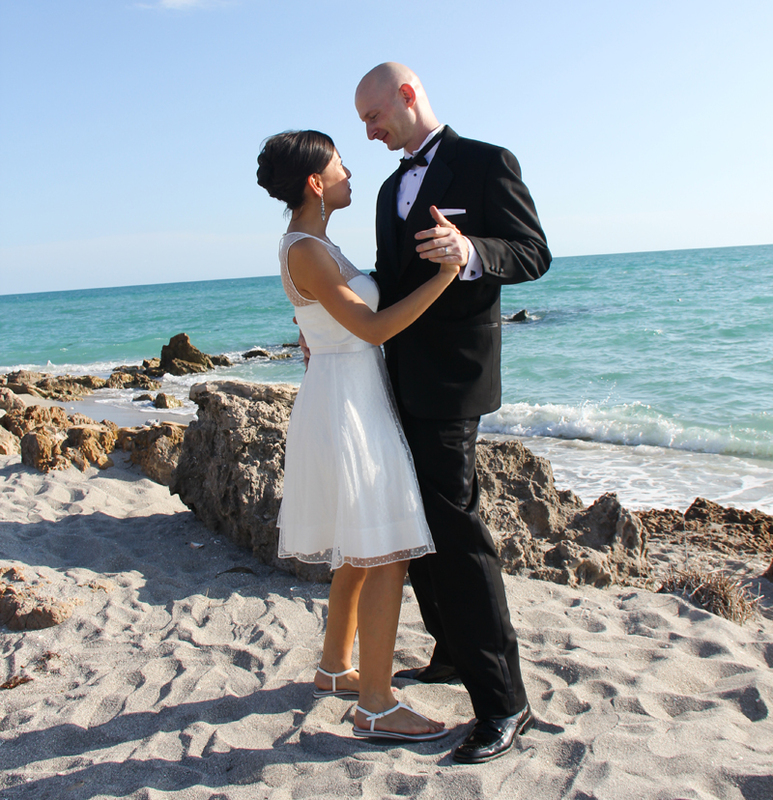 Steven lent an air of tradition to the ceremony by wearing a classic tuxedo, which was a striking contrast to the casual beach setting. Once the scene was set, Shelia and Steven were ready to take their vows. Once Shelia and Steven said their vows, they posed for a number of photos that would allow them to cherish this special day for years to come. The couple posed together and separately, in a number of poses that highlighted their clothing, their wedding rings, and showcased the love and affection they have for each other. 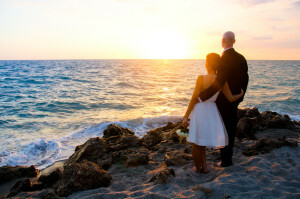 The ocean backdrop gave these photos a fantasy-like quality that traditional wedding photos often lack. The happy couple kissed and held up a small chalkboard sign that proclaimed, “JUST MARRIED!” in chalk, with the accompanying date, a whimsical touch that friends and family are sure to enjoy. Once the posed photos were taken, the couple was ready to enjoy their first dance together as husband and wife. Shelia and Steven’s elopement wedding proved that you don’t need a state-of-the art sound system or a crowd of people watching to enjoy a first dance as husband as wife. Instead, the happy couple shared their first dance in a simple manner, with an iPod and some portable speakers that played their wedding song. The sound of the waves hitting the shore was a lovely complement to the music, and the lack of a crowd made the moment an intimate one for the dancing couple. 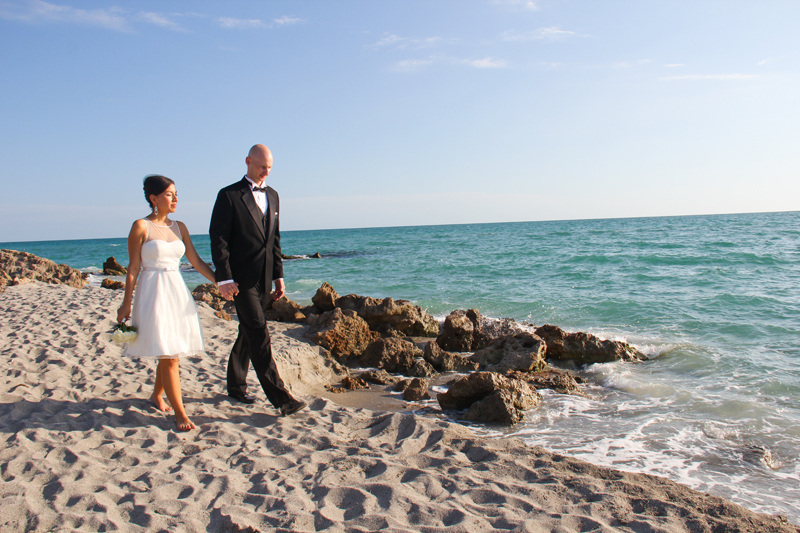 When the dance was over, Shelia and Steven took advantage of this beautiful locale and took a stroll along the beach as the sun began to set. During their walk along the beach, Steven and Shelia spent some time writing their names and drawing in the sand, smiling and laughing as the tide came in and washed it all away. While the couple enjoyed this whimsy, it was also symbolic to their union, as though tangible things can be washed away with the passage of time, memories and emotions last forever. The couple eventually kicked off their shoes and went barefoot as they enjoyed their walk along the shore, but there was one more activity to be enjoyed before the sun set on Shelia and Steven’s unforgettable day. 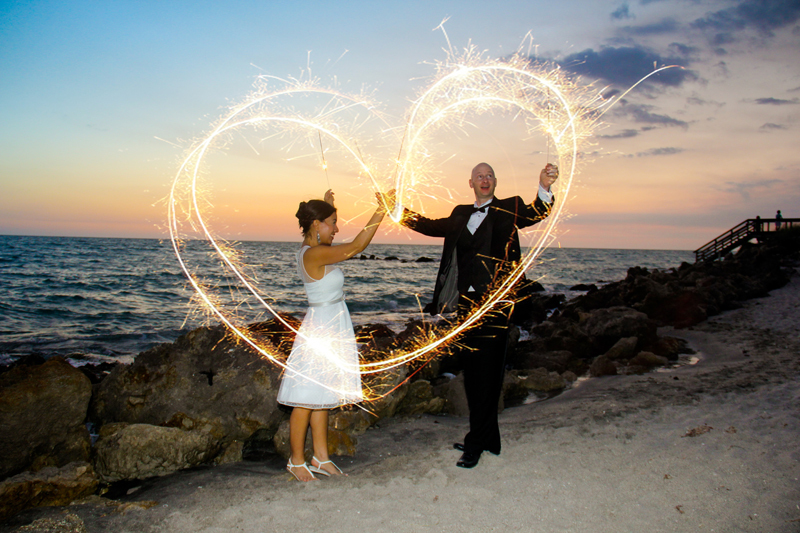 As the sun began to set on Caspersen Beach, Shelia and Kevin celebrated the coming of the evening by playing with sparklers. The couple laughed and joked as they tried to write their names in the air, but it proved to be harder than expected for them both. Despite the difficulty, playing with the sparklers on the beach as the sun went down was the perfect way to end this unforgettable day. Catie from PixelArt Photography (a Siesta Key photography company) captured the moments with perfection. From a mix of the traditional and the casual, the expected and the unexpected, Shelia and Steven’s elopement ceremony was as unique as the individuals themselves and solid proof that when it comes to getting married, all you really need is love. Summary: The elopement wedding ceremony of Shelia and Steven Keegan proved that the only things necessary for a wedding are love, commitment, and the willingness to blend tradition with fun in order to create a perfect day. If you are looking for Siesta key photography contact PixelArt Photography at 1-855-55-PHOTO.